In the process of creating my newly released novel, Uprooted, I've been reading fantasy fiction by alot of other authors, so I'll occasionally highlight some of these novels in reviews. 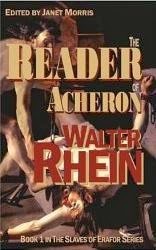 Walter Rhein’s The Reader of Acheron is a compelling tale about “dangerous” men in a culture where reading and thinking among the lower classes is actively discouraged by the ruling class. Part way through you realize this isn’t a typical fantasy setting. The old civilization has fallen, to be replaced by a tyrannical class of elites who rule over a frightened population of illiterates and drug-addled slaves. It’s a society whose stability rests upon a foundation of ignorance. Those who won’t remain in the dark become threats. And yet, it’s not that simple – a secret twist lurks in the background. There are four or five major characters. Each is tantalizingly fleshed out. Two main heroes – one a slave, one a soldier – each suffer under their own burdens of servitude, and each fights back by seeking both freedom and awareness. I most enjoyed the main character named Quillion. He’s a clever, crafty, “chaotic good” figure whose methods are unorthodox and inscrutable (he reminds me of Mel Gibson’s character in the “Lethal Weapon” movies). I laughed when I got to the line, “This wasn’t the first time in his life of questionable acts that he wondered if he’d made a fatal error.” That’s the essence of what makes Quillion an entertaining, catalytic element who keeps the reader flipping pages to find out how he’s going to get out of his latest fix. I could not identify so well with Kikkan, the slave. This is partly because his motivation and drives are so relatively simple. Yet he also exhibits a high degree of sophistication in his thinking and actions at other times. By the end of the book it feels natural, but the dissonance was a bit jarring early on. This is a professionally done work that compares favorably with books you’d find on the shelves of your local bookstore. I had remarkably few editing niggles, and they didn’t detract from the story at all. Rhein’s craft draws you in. His writing is atmospheric, portentous, descriptive, ironic, emotive. He gives clever attention to human nature and the nature of authoritarian government, and even bureaucracy. It’s a thoughtful book with a lot to say about philosophy and politics. And by the end you know the adventure has only begun, which perfectly builds the reader’s anticipation for the next volume in the series. To purchase The Reader of Acheron, visit Amazon.com.